Using Alt + Tab may cause issues on Windows XP The Brooks family boarded the Neptune hoping for a relaxing family vacation, but what they got was an incredible adventure! After the cruise ship encounters an incredible storm, it’s left sinking in the Pacific Ocean with everyone on board! 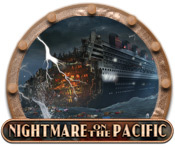 Live through a Nightmare on the Pacific in this exciting Hidden Object game. Put survival first and help the Brooks family make it out of the Neptune alive!